For many years I have been developing a curriculum to inspire people to learn to play fiddle in a fun and simple way. Whether you are new to the instrument or the style, or have taken a break from playing, this course covers fundamental fiddle techniques and standard repertoire. Session 1 focuses on essential techniques and simple tunes. 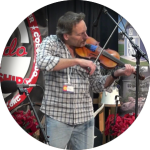 As a teacher, my goal is to simplify the fiddle and help you practice more effectively and enjoyably; as a fiddler, my hope is to perpetuate quality traditional fiddle music and inspire you to progress. These are guided practice sessions covering essential techniques and concepts for everyday practice. 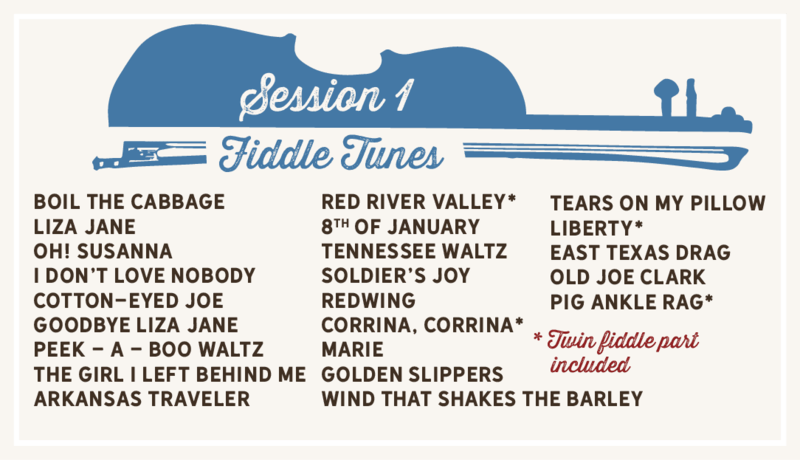 See and hear all 24 tunes with fiddle and guitar. Visit the Fiddle Lounge to hear our favorite fiddle playlist. There are 12 lessons in Session 1 with 2 tunes in each lesson, taught slowly by ear, sheet music included. Once you have learned the tunes, have fun playing with the guitar tracks at varying speeds. Your progress is automatically tracked so you know what you’ve done, and what to learn next! Want to be sure you are on the right track? We offer personalized progress reports and private lessons. Celeste Johnson started taking violin lessons when she was five, and soon after discovered Texas-style fiddle. She decided to focus her efforts on fiddle and entered her first contest just a year later. Since that first contest, she has traveled around the nation to compete and has won numerous Colorado state titles and two regional championship titles. Celeste’s favorite contest is the National Old Time Fiddle Contest in Weiser Idaho, where she became the National Junior Junior Fiddle Champion in 2010 and 2011 and the National Junior Champion in 2015 and 2016. 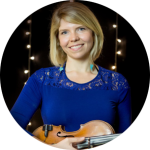 Celeste’s passion for fiddling also makes her a passionate teacher who seeks to help her students foster their own love for fiddling. 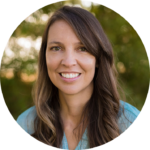 She has been teaching for over five years and is thrilled to be working as the online lesson teacher for Fiddle School. Katie is making me a confident, self motivated fiddle player! Katie’s patience and attention to detail accompanied by her ability to articulate, “how to produce a desired result,” have proven invaluable to my learning experience. Her personality and work ethic set the bar for fiddle instruction and her enthusiasm and ability to customize my instruction to my current skill level provide me with positive feedback and a successful learning experience. Katie’s expertise took my playing to the next level! When I first came to Katie, I had a lot of enthusiasm for fiddling, but I didn’t know how to achieve an authentic sound. Not only was Katie able to fine-tune my techniques, she helped me learn how to critique my own sound, and empowered me to be my own player. Katie is an articulate, inspiring and supportive teacher, who is dedicated to creating rich learning experiences. She will always be my go-to for all things fiddle! Katie consistently pushes our girls to be their best selves. She is a true inspiration and a wonderful role model. Positive, encouraging, and highly motivating. Our girls love their fiddle lessons with Katie and always look forward to their time with her! …and has helped me truly understand the basic fundamentals of playing which create a much stronger base to move forward with faster. As someone who played for a year or two as a kid, quit (regretfully) and is now re-learning fiddle, it’s been amazing working with Katie who has answers to my playing questions, solid methods for practicing and un-learning bad habits. Her work ethic and passion influence all of her students and fans and she’s keeping the Texas fiddling tradition alive in Colorado. Here’s some of what you’ll get! What level player is fiddle school designed for? Session 1 is the foundation. If you haven’t played in years and want to brush up on your techniques, if you play classical and want to bridge over into fiddling, or if you are just beginning, Session 1 is for you. Coming soon will be Sessions 2-5. What style does fiddle school teach? 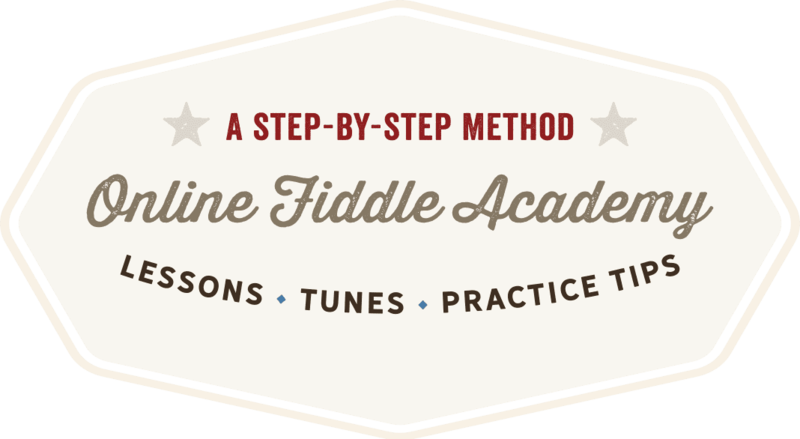 Fiddle School is taught from a Texas style fiddle perspective. You will have the opportunity to learn breakdowns, waltzes, rags, polkas, western swing and swing tunes. Many of the tunes crossover into other fiddling styles. Can an intermediate or advanced fiddler learn anything from Session 1? Session 1 has lots of great tunes and musicianship tips. Also, if you are a teacher you might gain some additional teaching tools. You can also take advantage of our Skype lessons and progress reports, we’d be happy to help you with your playing. What if I’ve never played the fiddle before? I would recommend beginning with a teacher in person, however if there’s not a teacher in your area, Fiddle School is designed to build all of your foundational skills. Does the subscription include private lessons? There is an additional cost for private lessons and progress reports. To sign up for a private lesson, click on the lessons link and you will be guided through the process of how to pay and schedule your lesson time. We'll be opening very soon! Sign up to unlock your free fiddle tune, complete with videos and sheet music! You'll also receive fiddling tips and other goodies, along with Fiddle School updates. Katie Glassman is that rare musician who possesses a combination of instrumental virtuosity and powerful musical expression. She is one of the country’s most renowned and decorated Texas-style and swing fiddlers, as well as an accomplished songwriter, singer, and a highly sought after teacher. Based in Boulder, Colorado, Katie currently tours and records with The Western Flyers, and leads her own band, Katie Glassman and Snapshot. She also maintains a thriving private teaching practice and travels to teach at music camps throughout the country. Since she began her Fiddle Parlor teaching studio in 1994, Katie has been enthusiastically educating Texas-style fiddlers of all ages, many of whom have gone on to become National and state champions. In 2017, Katie won her 3rd consecutive National Swing Fiddle Championship in Weiser, Idaho. She also took first in both the Bob Wills and Open divisions at the Bob Wills Festival and Fiddle Contest in Greenville, Texas and is the three-time reigning Colorado state fiddle champion. Other notable victories were in 2013 at Rockygrass in Lyons, Colorado, and Walnut Valley Festival in Winfield, Kansas, to name but a few. Katie holds a Bachelor’s in Performance with a Jazz Certificate from University of Colorado, Boulder, and in 2007 spent a year studying jazz violin at the world renowned Centre Musique Didier Lockwood in Dammarie-Les-Lys, France, though her true musical education came at the feet of the Texas greats she heard and learned from at decades of fiddle contests. Jimmie Don Bates, Dale Morris, Wes Wesmoreland and Joey McKenzie are Katie’s living links to the great tradition of Texas style fiddling.